Revenue grew at an average annual rate of 23% over 14 years. More than $300 million of new money flowed into the Canadian higher education system. 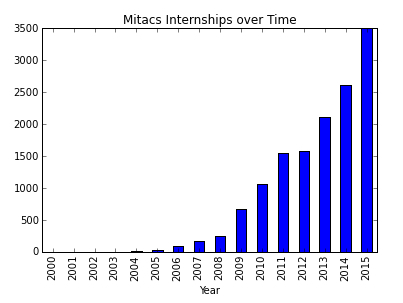 Canada’s R&D ecosystem was enriched through 15,000 Mitacs academic-industrial internships. Academic leaders noticed Gupta’s “Mitacs touch”: 60 (out of 95 nationwide) of Canada’s universities have become Mitacs partners. Government leaders noticed the Mitacs track record so Gupta was invited to serve on the Science, Technology and Innovation Council (STIC) and the Expert Panel that reviewed Federal support for R&D. 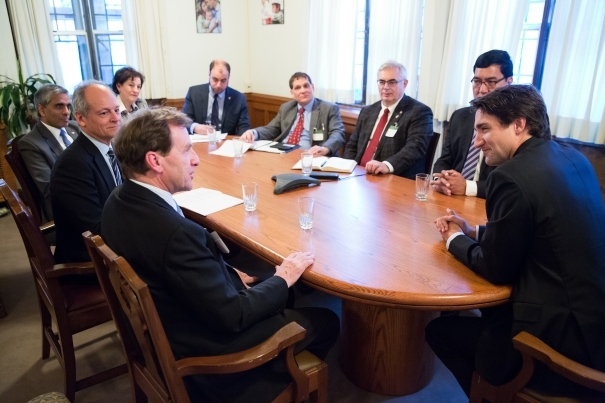 The Expert Panel reviewed every program in Canada’s research and development ecosystem giving Gupta enormous insight. Industrial partners (like The Boeing Company) also noticed and partnered with Mitacs. The opportunities created by Gupta and his team were also noticed outside Canada: Brazil, France, India, Germany, Mexico, Tunisia, Turkey and Vietnam have all formed partnerships with Mitacs. In Arvind Gupta, UBC had a leader who built partnerships with the Chrétien, Martin and Harper governments, with multiple governments in each of the provinces, with thousands of companies, and with many foreign countries. UBC’s appointment received national media attention. Gupta, in what appears to have been a first for a university president, was named on the Maclean’s Power List of top 50 most important people in Canada. Gupta was also invited, another first for a university president, to the federal finance minister’s policy retreat. He may have lacked the experience of being a Dean but Arvind Gupta’s vision, connections and accomplishments qualified him to serve as President of UBC. 2015 was a year of magical opportunity for the higher education system. Canada’s top three universities had new leadership. Former President of NSERC, Dr. Suzanne Fortier was entering her second year as Principal of McGill. Dr. Meric Gertler was entering his second year as President of the University of Toronto. Working together in advance of the federal election, Fortier, Gertler and Gupta had the chance to transform the government’s role in higher education. With Fortier’s Tri-Council background, Gertler’s expertise on cities, and Gupta’s record with Mitacs, these three university leaders had a unique opportunity to advocate for specific investments from the new government. The Trudeau Government will soon announce details for the 2016 budget. If they’d had the chance, could Fortier, Gertler and Gupta have enlarged the Tri-Council budget by an additional $3.5 billion? Could the anticipated infrastructure investments have been redirected to support the knowledge economy? With Gertler and Fortier adding support to the innovative arguments presented to the Vancouver Board of Trade, could President Gupta have secured billions in federal infrastructure investment for the Broadway transportation corridor? These serendipitous opportunities were lost when the UBC Board of Governors broke the synergy of this trio by forcing the resignation of President Gupta. 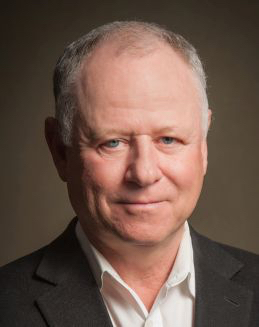 Gupta’s vision for UBC, as outlined in the leaked document from January 30, 2015, included a province-wide strategy with an expanded role for UBC Okanagan and a renewed focus on research excellence. The document also revealed plans for sustainable need-based and merit-based bursaries to support students. These plans have emerged as the Centennial Scholars Program, a legacy milestone during Gupta’s abridged presidency. Equipped with mathematical models, government relations expertise, and new mechansims to fund students, Gupta was poised to transform the rigid 2% formula for funding higher education that has been in place since 2005. With Ontario’s recent move to make tuition free for thousands of students and the upcoming provincial election, UBC had a special opportunity to influence the platforms of the political parties. The election is scheduled for May 9, 2017 so the platform planning activities will be taking place this summer and fall. UBC lost its opportunity to have an established president in place, with a team and strategy ready to influence government during this period. The Board took actions that left UBC tactically disadvantaged to leverage the 41st General Election of British Columbia. The presidential search, inaugurations, transition costs and legal fees will cost UBC millions of dollars. In the absence of a clear strategic vision, a mishmash of administrators from the Toope, Gupta and interim Piper presidencies direct their units as best they can. The next president will certainly make personnel changes which will incur costs. 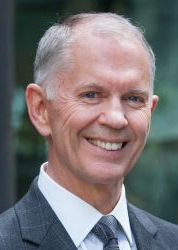 Thirty-nine days before President Gupta was forced to resign, UBC welcomed his administration’s new Vice President Finance Andrew Simpson. Mr. Simpson relocated to Vancouver from New Zealand. Actions by the current UBC Board created a situation in which Arvind Gupta continues to be paid presidential salary while UBC also pays the salary of Interim President Piper. Instead of investing in scholarships, research facilities, or faculty renewal, this Board wasted millions of taxpayer dollars on a presidential transition. Their reasons for taking these actions remain unexplained. UBC lost a great opportunity in Arvind Gupta as president. Rather than a different president, what UBC needed was a successful presidency, which requires support of the Board of Governors. Actions by the Board have created initial conditions that make a successful presidency extremely unlikely. The leaked documents reveal that Chancellor Lindsay Gordon, Vice Chair Greg Peet and former Chair John Montalbano acted as a secret committee to force the resignation of President Gupta, without righful involvement of other governors, and without the formal performance review promised in his contract. The unexplained termination of the previous president caused a loss of momentum and reputational damage to an institution that will be dealing with a prolonged period of unstable, incoherent, and unfocused management. Mr. Gordon and Mr. Peet are leading the search for the next president. Why, and on what basis and authority, were these men allowed to abort a presidency? With no new governance review or new best practices in place, what will prevent the formation of a future secret committee to control, interfere with or terminate the next presidency? The circumstances are suspicious. Can some members of the Board, acting secretly, wield excessive coercion over the next UBC president? The actions of this Board of Governors have done great harm to UBC, to British Columbia and to Canada. I stand with hundreds of my faculty colleagues to publicly indicate No Confidence in the UBC Board of Governors.